Placing his work somewhere between sublime and seemingly absurd, Ragnar Kjartansson is an Icelandic prolific artist, whose genre-bending installation/performances include music, video, painting, drawing and sculptural elements that careen between emotional extremes. By exploring his own physical and psychological limits and the themes of performance art, he also explores the artist’s status and different images this role usually carries along. Attempting to convey genuine emotion through melodramatic gestures and conversely reveals sincerity within pretending, he plays with stereotypes usually projected onto the persona of the actor and both celebrates and derides the romanticized figure of the artist as cultural hero. Often feats of endurance, lasting for hours or days at the time, his performances take motifs such as a pop song and transform it through protracted repetition into a transcendent mantra. Ragnar Kjartansson – The End, Venezia, 2009, Six-month performance. The Iceland Pavilion, palazzo at the Canal Grande, 53rd Biennale di Venezia, 2009 – image courtesy of the artist, Luhring Augustine, New York and i8 Gallery Reykjavik. Born in Reykjavik to a family of theatrical parents, Kjartansson draws from a varied history of stage traditions, film, music, and literature. His mother, Guðrún Ásmundsdóttir, is a well-known actress, and his father, Kjartan Ragnarsson, is a theater producer. They split up when Ragnar was young. His grandfather, after whom he is named, was a painter and ceramicist and best friends with Fluxus artist Dieter Roth when he moved to Iceland. Asked about his life in Iceland and thoughts on Reykjavik and the possibility of leaving it, Kjartansson said: “Considered it a bit, but it’s inspiring. It’s a small city with a fantastic arts scene, fantastic writers, designers, and fashion. There’s a mentality where everybody helps each other out. Iceland is almost like the pre-America because it’s the first settler culture.” Going into art school, he was very prejudiced, with no affection for modernity. This conservative set of ideas changed when he was exposed and actually saw the art, immediately falling in love with many artists and their work. A total revelation came with the feminist movement, and Carolee Schneemann, Marina Abramovic, and Joan Jonas. Through them, he was introduced to Chris Burden, Bruce Nauman, and Vito Acconci. His interest had always been old paintings, but the above-mentioned artists came into his life like beautiful cultural explosions and totally changed it. “[This explosion] started with my final piece from art school. It was a blend of a theatrical background and my obsession with painting and hearing about Chris Burden and Marina Abramovic. It was a little opera house inside the art school; I sang opera for the whole duration of the final show.” Music was also a significant part of his life and growing up, Kjartansson was always in bands. Coming from a relatively small county, Kjartansson first got into the international spotlight at the 2009 Venice Biennale, when he became the youngest artist to represent Iceland at this prestigious event. Every day, working in a palazzo on the Grand Canal, Kjartansson painted Páll Haukur Björnsson, a performance artist, in his speedos, standing against the medieval columns, sitting in the ornate font, or out on a terrace with the splendor of Venice behind. 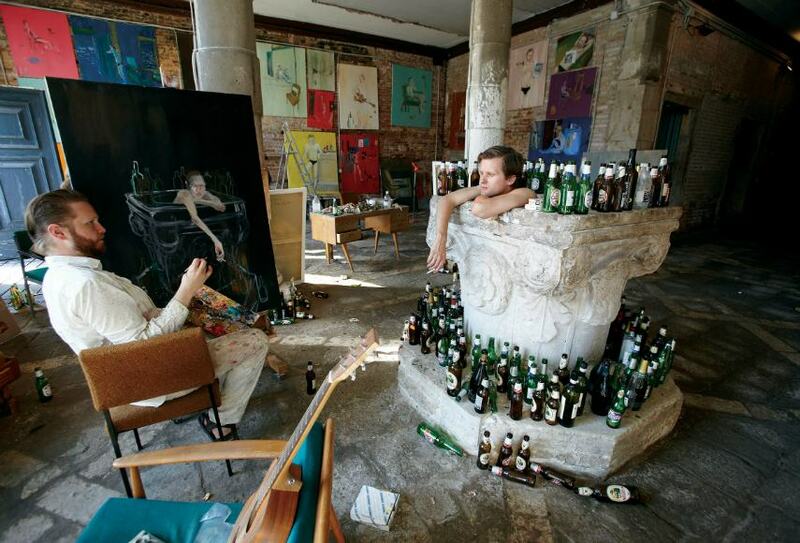 The two of them would drink beer and smoke continually for hours in a designated room – a satire of and homage to the Romantic notion of the tortured, intoxicated painter. Over the course of several months, onlookers saw the paintings piling up in the room. In 2013, Kjartansson was included in the main Venice Biennale exhibition, curated by Massimiliano Gioni, where he presented the S.S. Hangover—a boat floating at the end of the hall, perhaps alluding to the end of the vernissage week, when everyone seemingly leaves with some sort of hangover. On July 14th, 2016, Kjartansson’s mid-career survey had opened at London’s Barbican – he presented spell-binding and multi-sensory experiences amongst a wide-ranging survey, perfectly-timed to shine a spotlight on one of the contemporary art world’s most exciting and evolving artists. After a run at the Barbican, another major survey of his work runs October 14, 2016, to January 8, 2017, at the Hirshhorn Museum and Sculpture Garden. Part of the Smithsonian, the gallery / museum is located on the National Mall in Washington, D.C.
Ragnar Kjartansson – The Visitors, 2012. Nine channel video projection, colour, sound. Duration: 64 minutes. Courtesy of the artist, Luhring Augustine, New York and i8 Gallery, Reykjavik. Production photo: Elisabet Davids. Photo: Rafael Pinho. Speaking of the details of his work, the past once again shows its face. “I became interested in blending this theatrical fake world that I was raised around to the reality of performance art. My mother was an actress and my father was a director. So I was always in the darkness, always watching and learning to appreciate the repetition of rehearsal almost more than the linear completion of it itself. Repetition is just one of the most basic human elements. It’s the fundament for all religions. Religion is just basically about repeating something, and then life will follow that path.” The theme of repetition keeps coming up, as he is drawn to it probably because it turns the performative into something sculptural or painter-esque. Every new performance stops being narrative at a certain point in time, becoming cultural instead, and Kjartansson makes a connection between theater and painting – he is so used to being in a theater where there is always some narrative, but the painter inside of him prevails, admitting that he’s more about the still moment. In one of his older works, Me and My Mother (2000) – the artist appears with his mother in a video, and she repeatedly spits in his face! It’s a series of works, actually, where a new video is being made five years after the previous one. Family relationships, the passage of time, as well as the artist’s and his actress mother’s private and professional faces are all addressed in these odd yet somewhat humorous pieces. The Visitors (2012), arguably Kjartansson’s most famous artwork to date, is a series of nine life-size video tableaux. Staged at the Rokeby Farm in upstate New York, it shows various musicians (each recorded in a separate space on the farm) repeatedly singing “Once again I fall into my feminine ways” for well over an hour. The End (2009) is a series of 144 paintings created during his performance at the Venice Biennale. 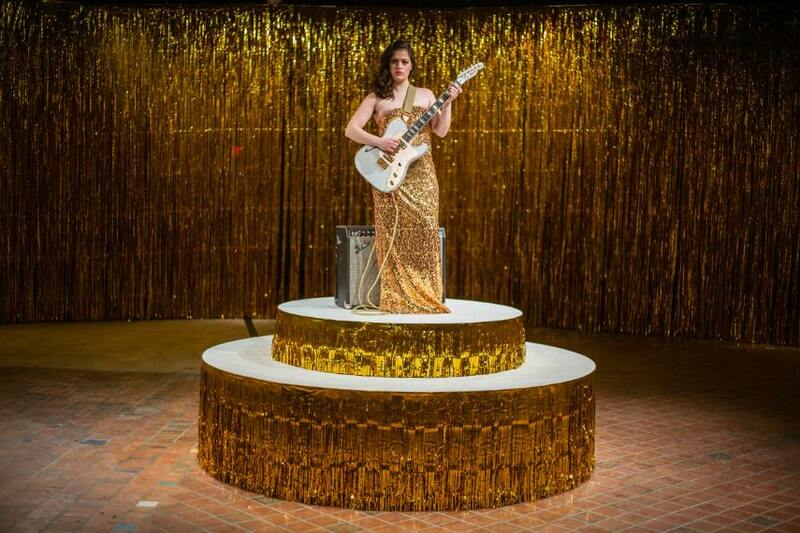 One of the most recent pieces, Woman in E (2016), features a woman posing in a gold sequined dress, on a gold-tinseled stage, endlessly strumming an E minor chord, conveying a melancholy, reflective feel while also offering an almost subconscious visual commentary on the objectification of women in society. Outside of visual art, Kjartansson seeks (and finds) inspiration in books and poetry, for example, some really influential people like Frank O’Hara, and the Icelandic author, Halldór Laxness, who was a glorious author and had won the Nobel Prize in 1954. His work truly resonates with Kjartansson because of its bittersweet taste and irony – but it’s irony filled with so much beauty. Music, as mentioned, is also a huge source of inspiration for him. Friends, as well. It’s important to surround yourself with people who support you. As for his working philosophy, elegantly put, “living through art is a better way to live”. Creating it is not necessary, but one should always be surrounded by it. The world is all about the beauty at the end of a day, and this is Kjartansson’s working mantra – simply trying to show his personal version of the beauty in the world. 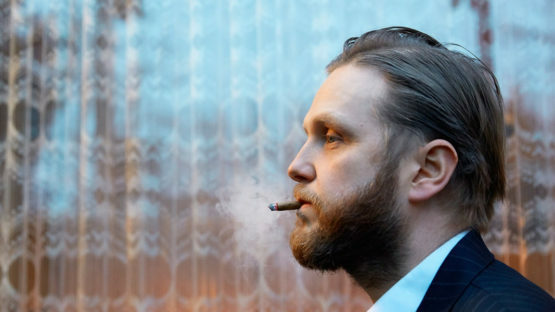 Ragnar Kjartansson lives and works in Reykjavík.